In the 13th century, theologians began in earnest to write Correctories to the text of Jerome’s Vulgate Bible (c. 4th cent), which had become corrupted over time through transcription and individual interpretation. Dominican friar and Hebrew scholar, Jacobus Magdalius (d. 1520), had his ‘version’ published in Cologne in 1508. This rare item is open to Magdalius’s corrections of the Book of Psalms – a topic that Luther lectured on in Wittenberg from 1513 to 1515. The words ‘Hieronymus’ and ‘Hiero’ appear often as Magdalius refers to Jerome and his Vulgate. 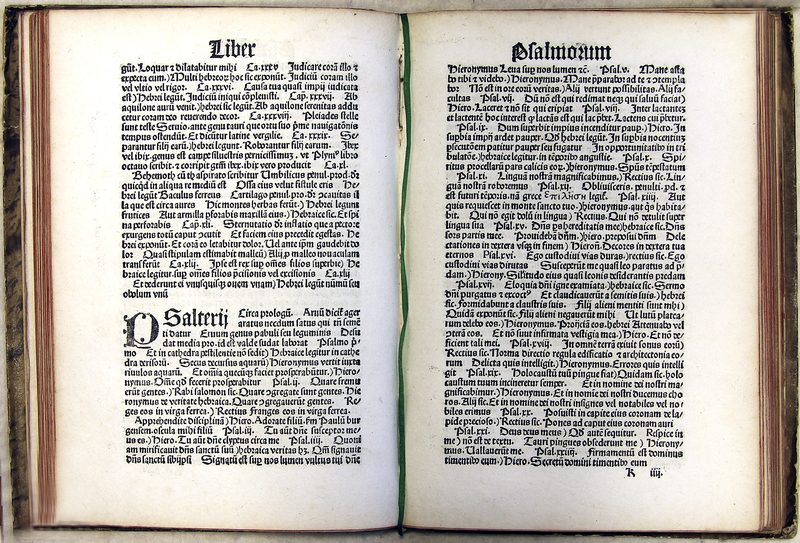 Perhaps Luther made use of this printed edition to inform his lectures and interpretations of the Psalms. [Jacobus Magdalius of Gouda, ed. ], “Correctori[um] Biblie,” ourheritage.ac.nz | OUR Heritage, accessed April 20, 2019, http://ourheritage.ac.nz/items/show/10328.